Poultry business usually formulated to supply or produce egg. The main animal of poultry business is chicken and duck. Both of them rise to earn eggs, cattle, and feathers. We surely know that eggs are also one of all nutrition sources to fulfill our vitamin necessary. Usually poultry is not selling all of the duck production. The farmer put the half of production result to rise again and replace the old one. This cycle developed to the child can replace the parent, the young replace the old, and the kid replaces the adult. The cycle of live is like that, right? Before we talk deeper about the eggs itself, basically both of duck eggs and chicken eggs had different side. Therefore, the both duck and chicken egg has different type from which depended of their breeds. Maybe you just noticed that the chicken egg is the brown and the duck egg is the green, but there are more differences than that. For make you more understand about the differences, here are some differences of duck egg and chicken egg that you must know. Talk about the shape, well this is the easiest thing that every people can answer when they ask about what is the different between duck egg and chicken egg? We surely know that duck egg is bigger than chicken egg. It is not because of the duck parents are bigger than chicken parents, it’s all purely of the shape itself. 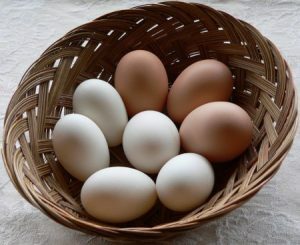 Also, the color of duck egg tends to green and the chicken egg tends to brown. So as mentioned before that it’s not only about the shape but it is also the color. As mentioned before that duck egg is bigger than chicken egg. This shape is affected their contained a lot. But it doesn’t mean that the chicken egg has lower nutrition than the duck’s. Looked by qualitative perspective, both duck egg and chicken egg almost has same quality. But if we see from quantitative perspective, the duck egg surely has much vitamin than chicken egg. Some vitamins like Vitamin B6, Vitamin A, Vitamin E, Vitamin D, and Vitamin B12, pantothenic acid, folate, niacin, thiamin, retinol, and riboflavin. Duck egg has more protein than chicken egg. But for carbohydrate, both duck egg and chicken egg has same contained. If we talk about mineral, fortunately the mineral that contained both in duck egg and chicken egg has same contained. Both of them have some minerals like iron, manganese, copper, potassium, selenium, sodium, and zinc. But if we talk about the quantity, the mineral that contained in chicken egg is more than duck egg. And if we talk about the calories, well the duck egg is the winner. In the duck egg, there are 185 kCal energies. Well this number is bigger than chicken egg which had 149 kCal energies. The cholesterol usually place on yolk of egg. Well as mentioned before that duck egg is bigger than chicken egg of the shape so it is automatically make the yolk of duck is bigger than the chicken. It is also the sign which shows you that the calories quantity also bigger than chicken. If we count, every 100 grams of duck eggs contained 884 mg cholesterol and for every 100 grams of chicken eggs contained 425 mg. The high cholesterol it also big the fat, and once again the duck egg is the winner. Actually in 100 grams of duck eggs contained 3.68 grams saturated fatty acid which is higher than chicken eggs with 3.1 grams. But for monounsaturated fatty acid on duck egg is 50% bigger than chicken egg. Egg is the main ingredients if we want to make the bread. Basically the yolk is usually used for produce the bread. As you know that, usually people used chicken egg as main ingredient to make bread. But did you know that change the chicken egg to duck egg can make your bread crispier, fluffy, and tastes better than using chicken eggs like widely used. The factor that may affect this is because the fat and cholesterol that contained duck egg is bigger than chicken egg. Usually fat and cholesterol able to gives the taste and texture over bread. So maybe because of that the taste is different when we used different egg. And that’s all the differences of duck egg and chicken egg that you should know. You better choose the egg as suit as your need because the needs of each other is different. Basically the nutrition that need by someone matches something like age, weight, and height. Remember, over nutrition is not good so does lack of nutrition. So you better make it balance to make you enough energy to pass the day.